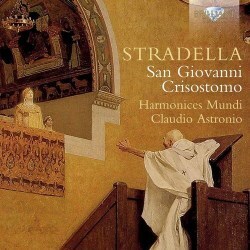 Alessandro Stradella was one of the most famous composers of his time. When he was stabbed to death in 1682 it was said that "an Orfeo was murdered". The largest part of his oeuvre consists of secular cantatas; he also composed a number of works for the stage. He is known to have composed at least seven oratorios; the first, on a Latin text, has been lost. The other six belong to the genre of the oratorio volgare, the oratorio in the vernacular. The best-known and most frequently performed in our time is San Giovanni Battista (St John the Baptist). The present oratorio suits that ideal. It takes us to the time when John Chrysostom, one of the main early church fathers, was archbishop of Constantinople. He criticized the extravagances of Aelia Eudoxia, wife of Emperor Arcadius, who had her statue erected in the Augustaion, near the archbishop’s cathedral. John denounced the pagan dedication ceremonies and compared her to Herodias, the daughter of King Herodes who asked him to give her the head of John the Baptist (that is the subject of Stradella’s oratorio San Giovanni Battista). This resulted in his exile. It is not known when or for which occasion the oratorio was written, and the author of the libretto has also remained anonymous. Carlo Vitali, in his liner-notes, comes up with some interesting suggestions, which cannot be summarized here. They also don’t really matter in regard to the assessment of this oratorio and the way it is performed. The oratorio has been preserved in a non-autograph manuscript. This only mentions the roles of John Chrysostom and Eudoxia; the identity of the other characters has to be deduced from the story. The first recitative - scored for tenor - is given to a testo, a role in most oratorios by Carissimi and his immediate successors in this genre which one could compare with the role of the Evangelist in Bach's Passions. Here, however, this character doesn’t play any part during the oratorio and only returns at the end (there it is surprisingly given to the second soprano). It is assumed that in the other recitatives and arias the tenor represents Theophilus, Patriarch of Alexandria who was a firm opponent of John Chrysostom and is portrayed in the oratorio as a slavish follower of Eudoxia. The role of the alto is identified here with an envoy from Rome (Inviato di Roma), sent by Pope Innocent I. The minor characters cannot be indentified; some of the duets - for instance the one that opens the work - are given to Eudoxia's counsellors. It was common practice at the time to score an oratorio for five solo voices (two sopranos, alto, tenor and bass) who also take care of the choruses. That is the case here as well, but - unlike most other oratorios - this work includes just one chorus. That doesn’t close the oratorio, as one would probably expect, but is No. 16 in the first part. The work closes with a recitative which includes the moral of the story: “In vain do the godless hope that the cloak of royalty will serve them as a shield against extreme misfortune: God is not unwilling to strike monarchs down.” Whereas many oratorios included instrumental parts, mostly for two violins, in this oratorio the singers are accompanied by basso continuo alone. The core of this oratorio is the conflict between Eudoxia and John Chrysostom. Even so, it is not particularly dramatic. As Vitali states in the booklet: “This is not an action drama but rather a choral debate about ethico-political values: ‘reasons of state’ versus pietas, based on the thesis that every human authority must accept its limits, bearing in mind the universal law of mortality and the almighty justice of God”. From that perspective I prefer the performance of the Ensemble Mare Nostrum, directed by Andrea De Carlo on Arcana (review). Here, Claudio Astronio and his singers take a more dramatic approach, and that goes especially for the role of Eudoxia, sung here by Francesca Cassinari. Some of her arias are faster and more passionate, but it seems to me that they are a bit overdone. From a purely musical point of view I also prefer Arianna Venditelli in De Carlo’s recording. That said, I certainly have enjoyed this performance. In particular, Carlo Vistoli as the Roman Envoy and Alessio Tosi as Teofilo are very good. If you purchase this disc you will not regret it. However, take into account that the booklet includes the full text, but without any translation. In that regard the Arcana disc is to be preferred as well, as its booklet includes translations in English and French.